You’re playing a $1/$2 heads up cash game with $400, your opponent also has $400. 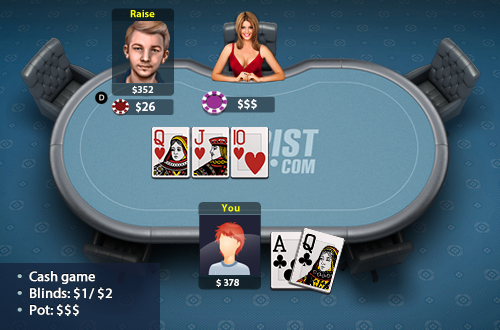 You have been trading pre-flop pots to 3 bets every other hand for around 50 hands. You get AQ suited of clubs and raise to $6, you get 3 bet to $22, and you decide to just call. The flop is QJ10 all hearts and your opponent bets $26. Lade die Texas Holdem Poker-App auf dein Gerät herunter! Spielen Sie Pokerist Texas Hold’em Poker noch heute – Teil der besten, sozialen, kostenlosen, Online-Casinospiele für Smartphones und Tablets. Laden Sie Pokerist Texas Hold’em Poker noch heute herunter. Kostenlose Tagesboni & gratis Chips warten auf Sie.